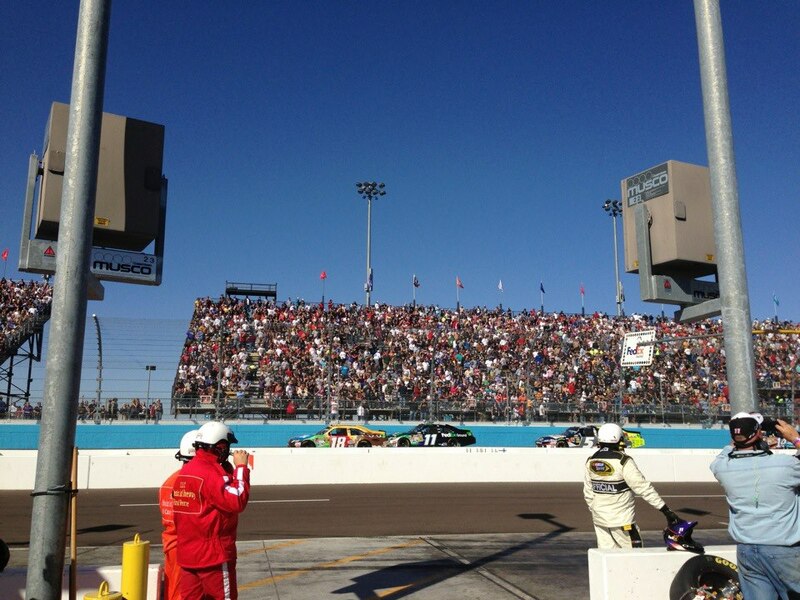 After leading 46 laps in the Advocare 500 Sprint Cup race at Phoenix, Denny Hamlin brought the #11 FedEx Toyota Camry to a 2nd place finish. Denny definitely faced adversity throughout the day but overcame it for a strong finish. Early in the race Denny followed team mate Kyle Busch in 2nd place. Right before green flag pit stops, Denny would finally take over the lead. The #11 pit crew did their job and got Denny back in the lead during green flag stops. Unfortunately mid way through the race during a yellow, the team made an adjustment that made the car very tight for Denny. Denny fell back to 7th place. Thanks to great pit work, adjustments, and driving the #11 team rallied back to a 2nd place finish in a wild race at Phoenix. One that involved paybacks, fights, wrecks and lots of excitement for the fans that could be arguably the best race of the season. With Denny’s 2nd place finish he moves up to 5th place in the points standing as he heads to the final race of the season at Homestead Miami. Can you describe today’s run? Had a great time and Denny ran a great race. Lots of excitement at the end!